We have closed for the season. We have had a very busy selling season and so are already sold out. It has been great seeing our very faithful long time customers and meeting many new people. We are sorry to disappoint so many by closing this early but if the trees are gone - they are gone. 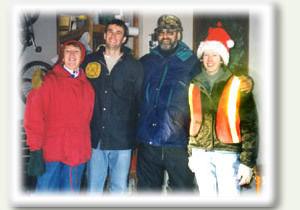 We would like to wish everyone a happy and safe holiday season and we are looking forward to seeing you next year. We had a very good opening weekend. (Possibly the best ever!) Saturday morning was good but the afternoon rain slowed things down. Sunday was busy all day but we never were too crowded. People seem very pleased with their selection. This coming weekend we are open Friday, Saturday, and Sunday from 9:00 AM to dark. As usual the very best selection is available for the people who come first. Looking forward to seeing everyone! The big day is one week away! We open on Saturday November 24 at 9:00am, and close at dark. After the first weekend, we will be open Fridays, Saturdays, and Sundays until we are sold out. The new picture we just added on our Facebook page (facebook.com/smithschristmastrees) shows the “natural” look we are trying to feature. We trim all of our trees by hand with hedge clippers. We do have tall trees, but they always go very quickly! This is our favourite time of year, and we can't wait until next weekend! We are looking forward to greeting old friends and meeting new ones. 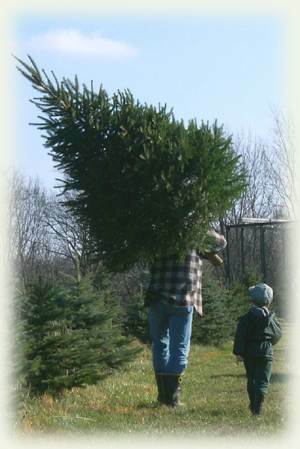 The majority of our trees are Colorado blue spruce and Meyer spruce. Both varieties look quite similar, they keep their needles well, and are rigid enough to hold heavy ornaments. I like growing them because the deer do not munch on them as much as they do other varieties. Our supply of Balsam fir is down quite a bit from last year. They are quite popular with both the customers AND the hungry deer! We are pretty well out of pine this year. We are now “Closed for the Season”. It has been a very successful selling period, with many longtime customers again dropping by. The weekend of November 25th was probably the busiest opening weekend we have ever had! We had excellent weather for the first two weekends, but the third was a bit cold for my old bones. We now start the process of cutting off the stumps and gathering things up to get ready for next year. Check the website as next Christmas draws near to get a heads up on dates we will be open, price, availability, and other pertinent news. Thanks to all of you who came to the farm this year, and helped to make this season such a happy one for the Smiths and our helpers Maureen and Morgan! We have had an amazingly busy first two weekends of sales, with lots of very happy and enthusiastic customers. The downside to this is that the selection of available trees has been reduced. That said, the farm is a great place for a walk among the trees followed by complimentary cookies and glass of hot apple cider, even if you can’t find a suitable tree, so feel free to come by and take a look! Also, Orchard Hill Road is closed west of our farm so you will have to come in from the east. If you use a GPS I suggest that you enter 2347 Hollow Road, Thorold. That takes you to the junction of Hollow and Orchard Hill Roads. Just follow Orchard Hill to our farm (about 1/2 km) Alternately you can go to www.smithstrees.com/directions for turn by turn directions. Our first weekend of 2017 went very well! Weather was not bad, and the visitors extremely happy and enthusiastic. The majority of trees coming out were balsam fir. One thing that took Jim by surprise was the heavier than normal flow of people before 2:00 on Sunday and the drop off after 2:00. It must have been the result of Grey Cup parties. This weekend is likely to be very busy on Saturday and Sunday so if you can we would suggest that you come up Friday. We are open from 9:00 ‘till dark Friday as well. This is the day we have been working towards all year. The weather started out with rain at 6:20 this morning, but the forecast for this weekend is pretty good. Because of the heavy sod in the plantation, mud should not be a problem even if we get a lot of rain. Mary and I went out yesterday and cut our tree while we had a chance. Selection looks pretty good to me, but I am a bit prejudiced! As in the past we suggest coming up early in the season for the best selection. Also, if you can make it on a Friday you get easier parking. Looking forward to again greeting old friends and meeting new ones. We are getting close to our opening day (Saturday Nov. 25), and that is always an exciting time. There was an adequate amount of rain this year and no late damaging frosts, so it was a good growing year. The pine were pretty well all sold out last year so I am sorry to say that we will not have any this year. (Is this the year for you to switch to a fir or spruce?) We quit planting pine because they can be prone to disease and the deer love to eat them. As in other years, we suggest that you come out for your tree early in the season. If you are looking to beat the crowds once we get into December, you might want to come out before 10:00 am on a Saturday or Sunday, or anytime on a Friday. Looking forward to seeing you all – even if it is just for a handshake and a “Merry Christmas”!